Although our collection of solid pine storage furniture is small, the pieces we do have are very aesthetically pleasing and most importantly, incredibly functional. 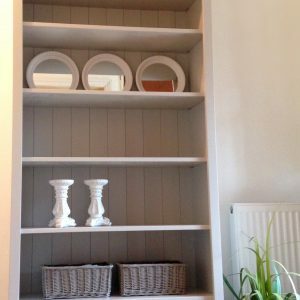 Whether you are looking for painted pine drawers, painted oak drawers, painted pine shelves or painted oak shelves – this is the section for you. Nest at Number 20 are proud to say that all of our furniture, including the bookcases and tallboys featured here, are made from 100% solid pine and oak and are made by hand by our highly skilled carpenters using traditional techniques. 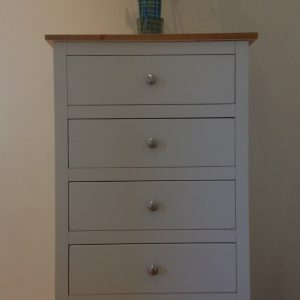 As with most of our items, the available sizes range from the smaller pieces at just 3 ft to the larger models that can be as tall as 9 ft.
We know only too well that individuality is important for our customers, which is why, at no extra cost, you can choose the Farrow and Ball colour of paint you would like your oak or pine storage furniture finished in. If you are interested in purchasing a solid oak or pine storage, drawers and shelves from Nest At Number 20, have any further questions that have not been answered on our site, or would simply like to make any other enquiries please do not hesitate to drop us an email at nestatnumber20@gmail.com. We look forward to hearing from you.